i captured it using my webcam, tuh laa psal. malas r nk g amek camera. 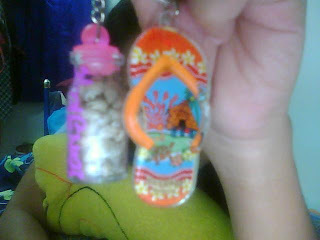 the key chains are from norly & nad. thanks gurls! having fun but still havent forgotten me. heheh. they went to teluk batik last saturday. slept over at nad's house. i couldnt join them coz ada date. heheh. klu x, msti besh kan kan? ohh yeahhh! to norly. i truly understood ur probs. huhu. ohh.hahah. td nad bwk i naek motor dye. goin to pusat islam. for what? tok smbhyang laa. hahah. then tetibe ley bangkit lak cite psal me living in US. hehe. i dont really like to tell anyone that i've once live there for 3 years. (*nah.dh bgtaw dh) huhu. but i really mish oklahoma. wlupon bukan lah bandar yg besar cm new york tuh, but the memories there is still in my mind. the snow & westwood eagles elementary school & home & laura. jp2. jason mraz? jason mraz? yana ajk g consert dye. n i rili want to. huhu. but this month budgt?? over budget dohh. hmm.dah2. now,my prob? trying to understand tax. gler r! skip 1 class pon dh penin, apalgi 2 class. how am i gonna catch up dohh?!. dh la friday neh ada test, bout the topic that en saiful taught in the last 2 classes. the class that i ponteng tuh. uhuhhu.